One of my absolute favorite stories is Peter Pan. I always told Chris that if we had a little boy I wanted a Peter Pan nursery, which was quickly vetoed at our gender reveal Disney trip when Chris realized Star Wars Weekends meant a Star Wars nursery (I wasn’t easily convinced). We ended up compromising and decided to do a Disney themed room for our little man that encompassed both Star Wars and Disney! Which meant I could stick in Peter Pan elements and it still went with the overall theme! While the five-year old child in me loves the Disney version of Peter Pan, the more “mature” side of me loves the movie Finding Neverland (Johnny Depp and that accent? Yes, please!). I always knew I wanted to incorporate elements from both movies into our little man’s nursery and could not wait to display them for when Little Fighter finally came home. My canvas was 11×16 so I decided to do two-inch stripes to the end. Looking at it now I wish I had done the top and the bottom the same colors. But I didn’t want to take the time to do the math to divide everything up right so….I got what I got. If you want the top and the bottom to be the same color, don’t be lazy like me! Type out your quote in your favorite fonts and add fun little embellishments along the way! I used Lato (a google font) and Isabella Script (from Creative Market) to get the quote the way I wanted it. For vinyl on canvas I always use a permanent vinyl (oracle 651) which you can get from Amazon (*affiliate link). My favorite is Expressions Vinyl, and their gold glitter vinyl is fantastic! I also used it on my Harry Potter Laundry Sign and think it’s the best thing since sliced bread. Seriously! To place the vinyl onto the canvas you’ll need some sort of sticky contact paper. A lot of people suggest using the cheap-o kind from Wal-Mart of Target, I don’t recommend it. I had a terrible time getting the vinyl to stick to it and ended up incredibly frustrated when it took me forever to transfer it onto my canvas! Get something of higher quality and save yourself the headache. And there you have it! 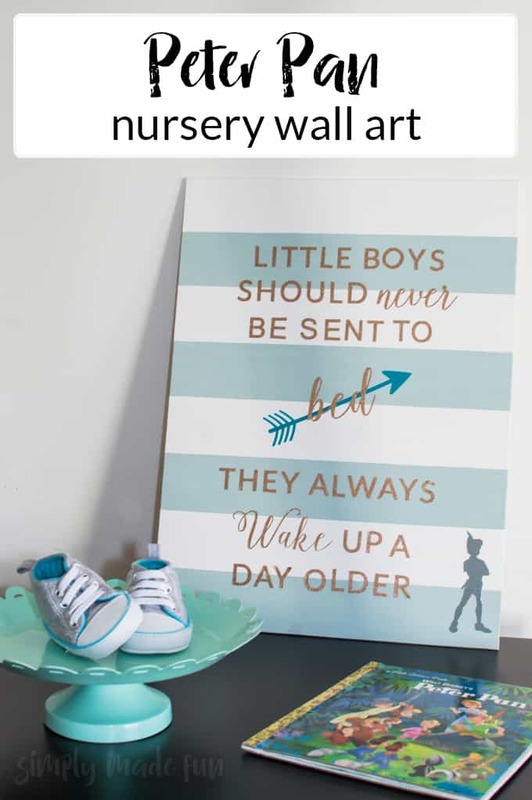 A sweet quote about little boys to hang in a nursery. But, this post isn’t over yet! I have something even more awesome in store for you! Today I’m linking up with four other bloggers (all of who are expecting babies this year!) to bring you fun nursery crafts and a really great giveaway. We’ve also paired up with different Etsy shops to create a gift basket for a mommy or mommy-to-be to win! They’re all so talented and I’m so excited to share their projects with you! So check out the other ladies posts below and then enter for your chance to win some really great prizes! This is so so so cute! I LOVE that quote and love how the canvas turned out! I’m obsessed with your nursery art!! Did you do a Peter Pan nursery?? I wanted one so bad and Joe wouldn’t go for it. I’m just going to live vicariously through you over here! This is adorable! 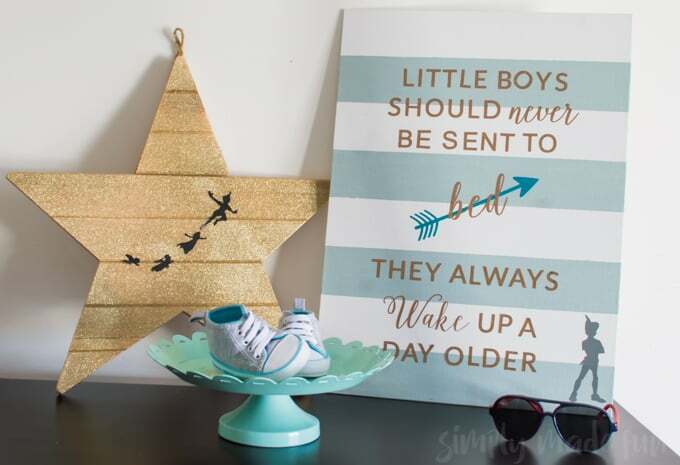 I love Peter Pan and think it’s just perfect for a nursery! Oh my, this is so cute! I’ve always loved that little quote and you turned it into something so precious! Thank you for sharing this with us!